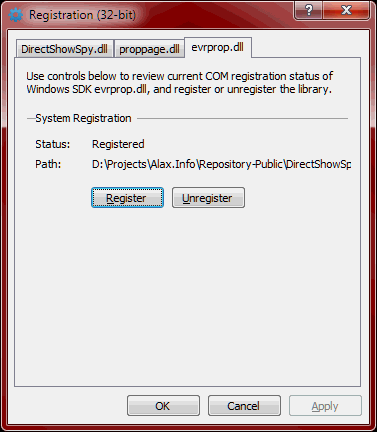 A small issue appears to be affecting DirectShow applications with DirectShow Spy installed. As underlying COM base is non-standard, the spy implements a few hacks to run smoothly and to keep reference counting correct in particular. Under certain conditions, DirectShow-enabled ActiveX control hosted by Internet Explorer seems to be unable to put its graph onto Running Object Table (ROT). What happened next is that Spy assumed ROT operation to succeed, and compensated reference counting, which under bad assumption could cause E_UNEXPECTED error while creating a filter graph. This updated fixes the issue. Another small improvement is that similarly to SDK proppage.dll, Spy registration UI also assists in registering another DLL – evrprop.dll, should it be there near the spy module.